Photographic Story. In the summer of 2016, I primitive-camped for 3 nights and 4 days at Dry Tortugas National Park, located 50 miles off Key West. In the brutal mid-July heat, I kayaked 3 miles, each way, across the open Atlantic ocean from Fort Jefferson to Loggerhead Key. I brought along my new underwater housing, and snorkeled around a colorful, pristine reef on the west side of the island. 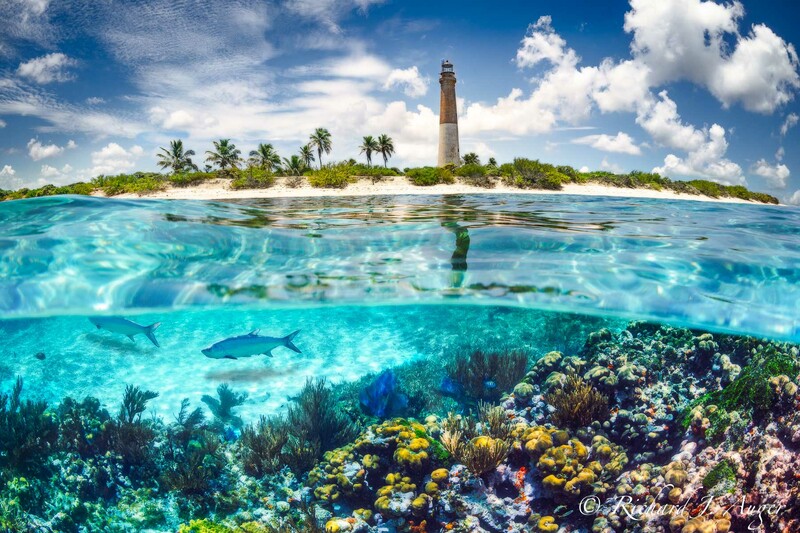 After hours of shooting over 2500 photographs, and about to give up, I finally captured a perfectly timed under/over image with 2 large tarpon fish, the lighthouse, some nice clouds, the reef (Little Africa), and a calm wave split down the middle. This was the most exhausting, well planned, and well timed photograph I’ve ever created.